When you visit Savannah and stay in Savannah vacation homes for the first time, it might be a little overwhelming. The city is packed to the brim with history and things to do. Fortunately, staying in vacation rentals Savannah GA by Southern Belle puts you in the middle of some amazing historic neighborhoods to get you started on your trip. Southern Belle's Savannah vacation rentals come in a wide variety of sizes and locations, but every single one of them feels like coming home for vacation. Tattnall Hideaway is one of our smaller Savannah vacation homes in the carriage house style. This is new construction and covers 650 square feet with one bedroom and one bathroom. Sleeping accommodations for three guests make it a perfect choice for a couple or a couple with a child. All of our vacation rentals Savannah GA offer a number of amenities that easily rival a hotel's. This property includes a washer and dryer, one queen bed, one sleeper sofa, a full kitchen with appliances, internet, flatscreen TVs and a great location just northwest of Forsyth Park. The sitting room of this property is cozy and comfortable, featuring a large sofa and flat screen TV. Classy, knotted wood floors are accented with an area rug and coffee table. Immediately adjacent is a quaint bar table and stools for two and the full kitchen. The kitchen has all necessary appliances and plenty of counter space to make great meals in the comfort of your home. The one bedroom features a queen bed with a cushioned headboard as well as a flat screen TV and two nightstands. The bathroom features a beautiful vanity with storage and a shower-tub combination. Being in the western part of the Historic District gives you easy access to some of Savannah's top attractions. Most prominently, the 30 acre Forsyth Park is only a short distance to the south and east. This park is one of Savannah's most recognizable places and a desirable location for nearby vacation rentals Savannah GA. Within the park is the famous iron fountain, a number of picturesque gardens, ancient oaks dripping with Spanish moss and a quaint cafe. The park routinely draws locals and visitors alike. If part of your stay includes a Saturday, then you'll want to check out the farmer's market on the south end. Chatham Square, one of Savannah's historic square, is slightly to the north-east of this property. If you're looking for a peaceful green spot shaded by ancient oaks, then this is the perfect square for simply relaxing or having a cup of coffee. Another nearby attraction is the Ralph Mark Gilbert Civil Rights Museum to the west. This museum is dedicated to the leader of what is considered the present day Civil Rights movement in Savannah. Compared to many other buildings in Savannah, this museum is rather modern, having been built in 1914. It was originally used as a bank for African-American citizens in the city and was the largest of its kind. It now houses three total floors of historic pictures and artifacts as well as a number of interactive exhibits. On the grounds, you will also find a gift shop, a book collection and a video and reading room. The Mercer Williams House to the north of Forsyth Park is a famous attraction as it was featured in the "Midnight in the Garden of Good and Evil" franchise. The house is still owned by the family and is functioning as a museum. Along with its place in the aforementioned franchise, the house is well-known as one of Savannah's more famous haunts. It resides in Monterey Square, which is also known to be haunted. Along with the most infamous murder detailed in the book, the house was the site of two other deaths to add to its haunted reputation. 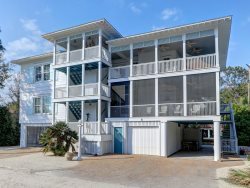 If you want to venture beyond the Historic District while staying in Savannah vacation homes, then one of the more popular destinations is Tybee Island. Here you can enjoy warm Atlantic beaches, fresh seafood at waterfront restaurants and a number of water activities. The main tourist attractions include the Tybee Lighthouse and the Marine Science Center. Make Southern Belle your first stop for Savannah vacation rentals when you plan your trip to Savannah. We offer a huge selection, plus the best locations and amenities. Give us a call today or book on our website. Southern Belle team members went above and beyond. I called a couple of times with questions and they were always very courteous and quick to respond. For example, one day we couldn't get the WiFi to work and they sent over a team member to fix it immediately. I was very grateful for helpful hosts! The Tattnall Hideaway was in a perfect location. It took less than 5 minutes to drive anywhere and was in a great walking neighborhood. Despite its convenience, it was located on a very quiet street and around the corner from Forsyth Park. We felt like we really lucked out finding this gem so close to the city! Everyone was very nice from booking through to the end when we called in and left a message. This was a beautiful place and very close to all the things we wanted. Easy and safe to walk around. We would stay at this property again in a minute!